KANSAS CITY, Mo. (WDAF) -- A federal affidavit filed Tuesday says that a convicted felon allegedly armed with a Bersa .380 semi-automatic pistol ran from officers and had to be wrestled to the ground inside a Walmart on Monday night. Jeremiah W. Flathers, 34, faces a federal count of being a felon in possession of a firearm and ammunition after he was arrested in the Walmart at 11601 E. U.S. 40 Highway. The affidavit says that Flathers was seen on surveillance after 7 p.m. opening unpurchased merchandise with a pair of scissors, and then walking around the store with the scissors pointed outwards. Officers were called, and he initially complied when they confronted him, handing over the scissors, though he appeared fidgety. When he heard a dispatcher relay over radio that he was wanted by the U.S. Marshals for amphetamine distribution, Flathers ran away. As he ran, officers say he was reaching towards his waist area and pockets before he was apprehended. He shouted "I have a gun" while he was on the ground, adding that it was in his pocket. Officers recovered the handgun and found that he was wearing a bulletproof vest, specifically an Emerson JPC plate carrier. The court document says that Flathers spontaneously said: "I was just trying to get rid of the gun and my probation/parole officer told me I could wear a bullet resistant vest." The vest had a pocket with four .380 rounds and four .45 caliber rounds; he additionally had eight live rounds in the Bersa .380. He admitted to possessing the gun and ammunition, and said that he obtained them for protective purposes. He added that he was having issues with unidentified people who threatened his family, and intended to kill them if he saw them. He's currently in custody awaiting a detention hearing. He faces up to 10 years in prison if convicted of the class C felony. 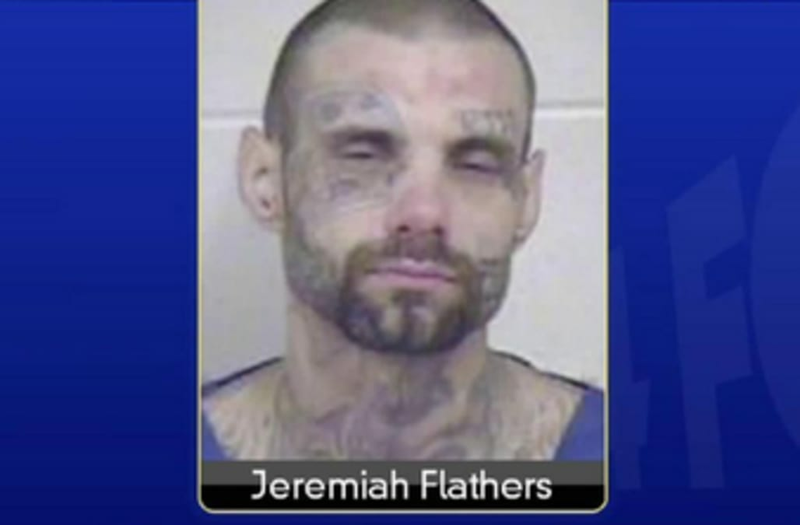 Flathers has previous convictions in both Missouri and Kansas for felony charges that include theft, resisting arrest, tampering with a motor vehicle, airplane or boat, and multiple counts drug possession.